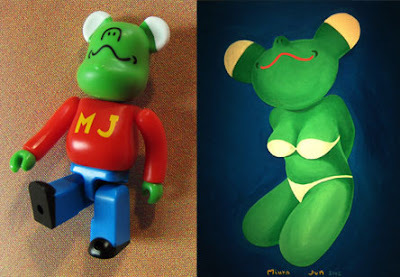 There is an 'MJ' Bearbrick (above, left), but it does not stand for Michael Jackson. 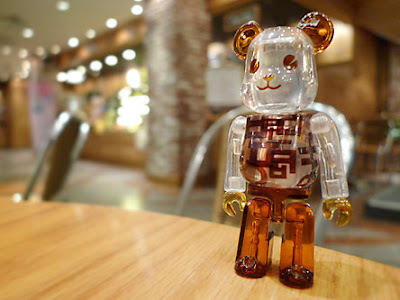 It's the one designed by 'Miura Jun' (or Jun Miura), a famous Japanese illustrator, for Bearbrick Series 16. 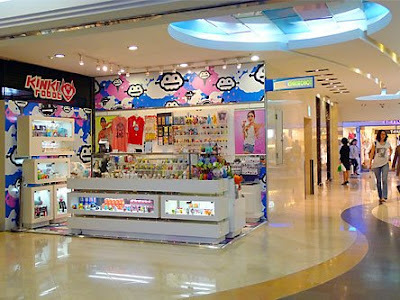 One of his artworks exhibited at the Tokyo Laforet Museum in 2002 (above, right) must have been the inspiration for it. 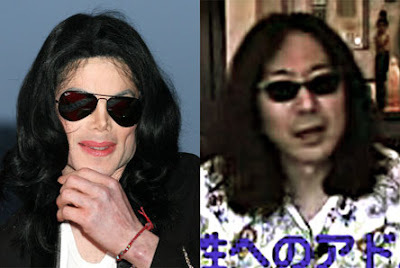 Judging from the pics below, it is easy to see that Miura (right) has something in common with the King of Pop. Check out a video of him here. 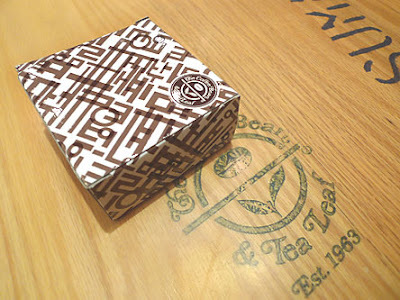 To tell you the truth, I didn't know what to expect of my first South Korean trip. My friend J and I only decided to fly there because Cebu Pacific Airlines had a big sale and it was the only Asian country that we hadn't been to. If you ask me, I knew nothing of the place, except that Seoul, the capital where we were headed, was the site of the 1988 Summer Olympics. It was a trip in search of an itinerary. Fine by me. The prospect of deciding where to go and what to do 'on the spot' was truly liberating. And I loved it! After days of wandering leisurely around the busy Myeongdong shopping area, taking a guided tour of the Gyeongbok Palace (with my Korean Flag bear, top pic), and strolling down the touristy Insadong-gil, I finally decided to try my luck with Bearbricks. 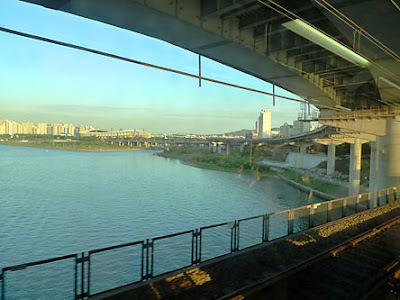 That search took me across the Han River to the Gangnam-gu area where the huge COEX Mall was. 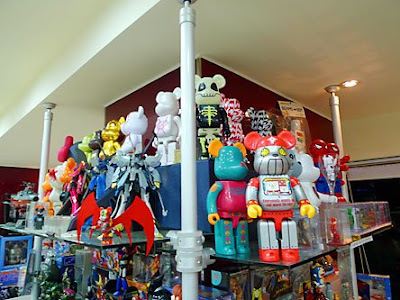 There, I found one (1) of the four (4) Kinki Robot stores in Seoul (see below). The toy store chain's managing director happened to be there. We got to chat a bit (nice guy) and he even helped me get a cab to the other Kinki Robot store in Sinsa-dong Kangnam-gu. That other shop is this one below. The guy with glasses is Jerry, the store manager. 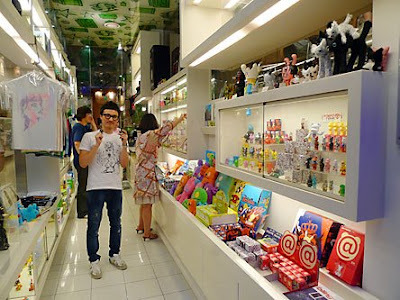 On the wall beside the cash register is a poster by the famous Seoul-based figure maker, Coolrain. 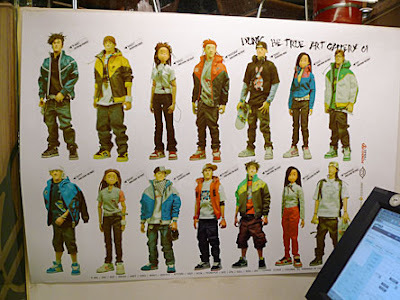 He's a Michael Lau copycat, but a very good one (the miniaturized Nike shoes are wonderful!) 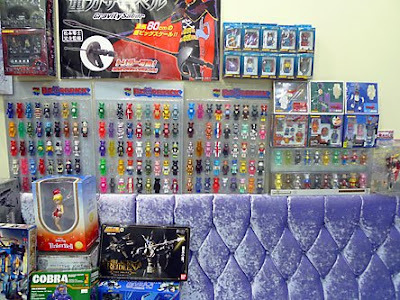 But you have to order online, where each of these handmade 12" figures will cost you US$770 – whoa! 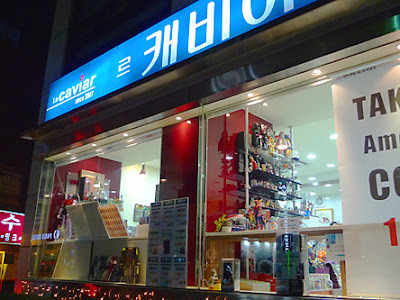 Just when I thought my search was over (I was ready to head back to my hotel with several new bears), I stumbled upon this cafe/toy store called Le Caviar (below), just about 50 meters from Kinki Robot Sinsa-dong. Outside, the place looked loaded! 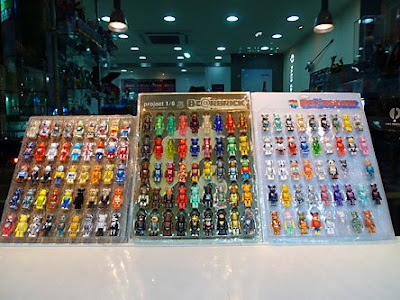 That night, I went back to the hotel happy – with 8 new Bearbricks (including the first die-cut metal one from Bandai) from three different stores. 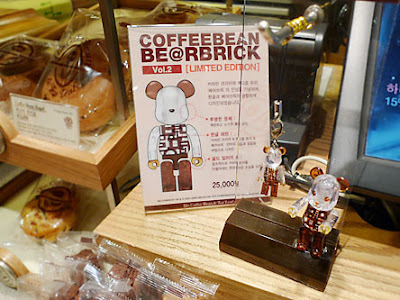 Bearbrick-hunting may be tiring for the body, but as far as I'm concerned, it's damned good for the soul, too!